Crossovers in combat sports have been come very popular with fighters. For example, Ronda Rousey moving to WWE, at one point Conor McGregor went over to boxing and throw hands with Floyd Mayweather Jr. f. Until recently it was announced last weekend that Brock Lesnar will return to UFC. Well, the sport of Muay Thai is no exception it seems to this crossover culture that has become commonplace within the combat sports community. 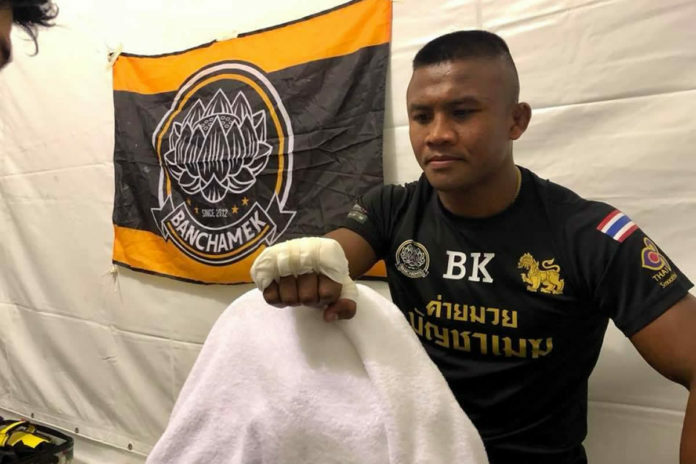 Muay Thai legend Buakaw Banchamek and Burmese bare-knuckle boxer Dave Leduc of Canada will face off each other in a bare-knuckle fight. The news of this brawl first appears on social media when World Lethwei Championship made a post on Facebook, following a recent signing of “The Nomad”, while “The White Lotus” will face Chinese Yi Long in the nine-minute knockout decider this October in Hong Kong. “Since (Buakaw Banchamek, is fighting KO to win rules in China this year, fans around the world are wondering how he would do against the Myanmar Lethwei Champion Dave ‘The Nomad’ Leduc in real striking: headbutts allowed & bareknuckle. In his previous fight early in March which was held in Bangkok Buakaw Banchamek defeated Artem Pashporin by a unanimous decision. The two-time K-1 World Max Champion is currently on a six-fight win streak. Before he had transitioned to bare-knuckle fighting in 2016, Leduc competed in Muay Thai scoring 14 wins out of 15 bouts in total. Moreover, 12 of his opponents he stopped prior to the final bell. His professional Lewthwei record states 4-0-6, 4 KOs. Which is still pretty impressive, even though dwarfs compared to Buakaw, See his video highlights below. Even though the resume of Buakaw is much more extensive (including a recently placed statue in his honor), Leduc’s tale of the tape is indeed impressive. Would the world of combat sports be really interested in the proposed battle? You can comment below.